The 65th Zomi Nam Ni Celebration is going to be held at Thyagaraj Stadium, New Delhi on 20 February 2013. The Celebration Committee and its sub-Committees have been making every effort and leaving no stone unturned to make the event a resounding success. The event will attract the Zomis from all walks of lives, and the who’s who of Lamka are expected to be in attendance. Union Home Minister Shri Sushil Kumar Shinde is expected to grace the Celebration as Chief Guest; while Shri Oscar Fernandes, MP & Chairman, Parliamentary Standing Committee on HRD, will grace the Nam Ni as Guest of Honour. Shri Phungzathang Tonsing, Minister (Health & FW/GAD/CADA), Govt. of Manipur will act as the Functional President. Shri H.S. Brahma, Election Commissioner of India, Lt. Gen. A.J.Parnaik, SM VSM, Director General, BRO and Shri Shambu Singh, IAS, Jt. Secretary (NE), MHA will be the Chief Hosts. Special guests who have landed in Delhi to attend the event include Pu LB Sona, Zomi Council Chairman, Pu K Guite, Zomi Council Steering Committee Chairman, Pu Vungzagin Valte, Parliamentary Secretary (Horti, Soil Conv & CADA), Pu Ginsuanhau, Singngat MLA, Pu Manga Vaiphei, Chairman, MTDC, Pu K. William Vaiphei, Zomi Council Speaker, ZOYCA President Pu Zakai Thawmte, Pu Dal Sian Pau, ZOLLS, Pu Dr R.Sanga, Zomi Council Steering Committee member, Pu K Vungzamawi, Secretary, ZEPADA hqtrs., Pu K.G. Tungnung, Secretary Zomi Council, Pu H. Kham Chin Khup, Treasurer Zomi Council. Pu L. Tualkhanhau, President Paite Tribe Council, Pu Khatkhotong Baite, President Vaiphei People's Council, Pu Kai Khan Mang, President. Tedim Chin Union, Pu B. Dongzalian, President Simte Tribe Council, Pu Manglianthang, President Uinted Zou Organisation, Pu M.C. Chinminthang, President Mate Tribe Council, Pu Pauminlianthang, President Thangkhal People's Organisation will be attending the Nam Ni as Special Hosts. Pu Langkhanpau Guite, Chairman, ADCC, and other ADCCs such as Pu H. Mangchinkhup, Pu M. Gouzamang Guite, Pu S.Kamsuanlun, Pu Genneikhup Vaiphei, and MDCs Pu Suanchinpau Guite, Pu Sumlianthang, Pi Grace Zamnu, Pu P. Sianzadong, Pu Minboi Vaiphei, Pu Lalditsang, Pu M. Ginzapau and Pu Tongkai Baite will be in attendance as well. Celebrated Lamka artistes are not giving it a miss either. The crowd will be entertained by musical performances from Kimjoycee Vaiphei, Muan Hangzo, TT Lal Zou, Rody Za Lien Sing, Thangginsang Tombing, Ramdinthari. A truly remarkable event is the - RED CARPET PHOTOSHOOT! - that will be open to all. 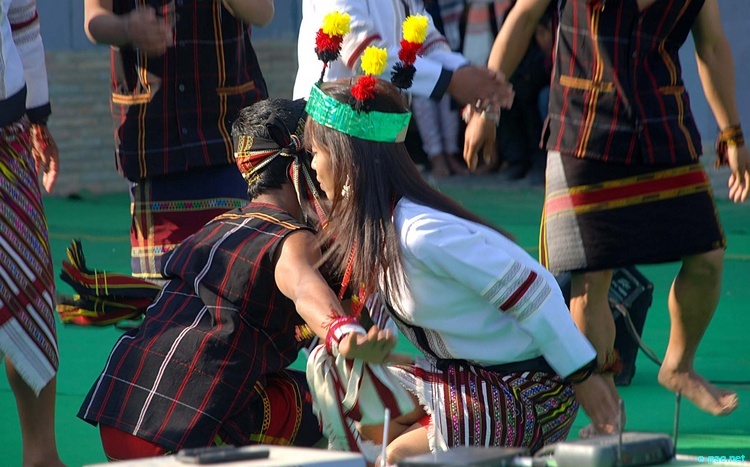 This special attraction is meant to showcase the rich Zomi traditional attires in various designs and the creativities of the Zomis in promoting the same. An intellectually stimulating Conclave on Challenges and Opportunities Facing the Zomis was held on February 19, 2013 at SSS-I, Jawaharlal Nehru University, New Delhi. Dr. Kamkhenthang Guite presented a paper on the Economic Challenges and Opportunites, while Dr. L. Lam Khan Piang and Dr. Vumlallian Zou chaired the talks on the Socio-Cultural as well as Political Challenges and Opportunities facing the Zomis respectively. Noted speakers on the occasion include Dr. Philip Thanglienmang, Pu Dal Sian Pau, Pu K. Zou, Dr. R. Sanga, Pu N. Neihsial, Pu Kaihau Vaiphei, Pu K. Guite, Pu K.Vungzamawi and others.